Three days after Russian long-range bombers struck targets in Syria after launching from an air base in Iran, new satellite imagery of the base suggests that Russia could maintain a small presence there for the near future. The images, distributed by the open-source intelligence site Stratfor, shows four Su-34 strike fighters, and what appears to be accompanying support equipment, adjacent to the Hamedan Air Base’s tarmac on Wednesday. The Su-34s’ enduring presence at the base follows the temporary arrival and departure of several Russian Tu-22M3 strategic bombers that used the air base earlier in the week as a staging point to bomb targets in eastern Syria. This is not the first time Tu-22s have made an appearance in Russia’s air campaign over Syria. Before Tuesday’s strikes, the long-range bombers had launched from southern Russia, not Iran. Sleek, with a swing-wing design much like the U.S. B-1, the Tu-22 can hold a sizable amount of ordnance and is considered a medium bomber. Using Hamedan as a staging point for the bombers would allow them to carry more munitions into the fight. When flying from Russia, the aircraft would have to compensate for the longer range by loading up more fuel instead of more weapons and ammunition. By taking off or refueling in Iran, the shorter distance between Hamedan and, say, eastern Syria, would allow the bombers to a carry a much larger payload, subsequently giving them more time over their targets and the ability to strike more of them. While staging and refueling Tu-22s at Hamedan would make sense–Russia’s largest air base in Syria is too small to accommodate a detachment of the aircraft — the enduring presence of the Su-34s in Iran is a little more confounding. A twin-seat, twin-engine multirole strike aircraft, the Su-34 has been flying from Russia’s Hmeimim airfield in Syria since 2015. The aircraft had only recently debuted in the Russian air force before its first combat sorties over Syria, prompting the Russian military to use the war-torn country as a proving ground for the aircraft’s capabilities. 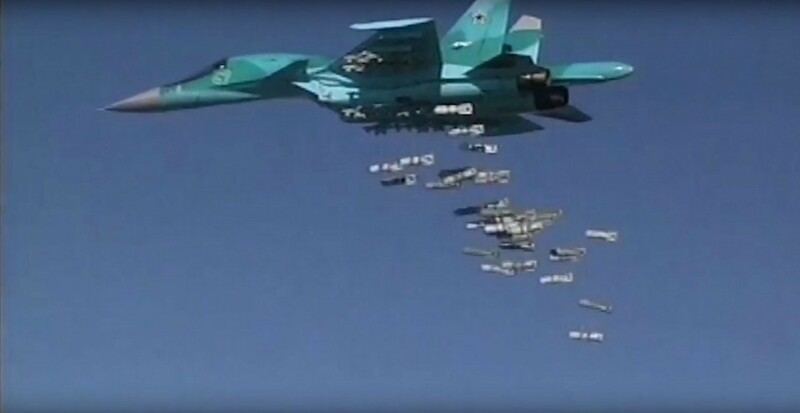 Flying Su-34s into Syria from Hamedan would make little tactical sense, as they would need to hold more fuel than normal if they were taking off from within Syria. 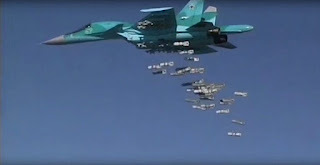 Michael Kofman, an analyst at the Center for Naval Analyses who focuses on Russian military operations, said there are two likely reasons for deploying Su-34s from Iran. The first would be to increase pressure on the United States to coordinate more closely with Russia; the second, to conduct air operations over Iraq. Still, the number of Su-34s at Hamedan is relatively small, and open-source satellite imagery has yet to show the foundation of any semi-permanent structures for the Russian aircraft and its associated maintenance crews, suggesting it might be too early to tell what Russia’s designs for the base might entail. “Right now, there’s nothing here to really get excited about,” Kofman said. Iran’s move to allow Russian aircraft to conduct military operations from within its borders is nearly unprecedented. Both countries are committed to ensuring that after a civil war that has already consumed the country for five years, what’s left of Syrian President Bashar al-Assad’s government does not fall to the Islamic State and opposition forces. Russia has provided a needed boost for Assad’s forces by way of airstrikes, artillery, combat advisers and equipment while Iranian special forces and militias have buoyed Syrian ground troops in offensives.